The project, demanding heavy investment, places Argentina through Bio Sidus, among the 9 countries in the world which have been capable of clonning livestock. The main target of this development is to obtain medicines for human health. On august 2002, after 278 days of pregnancy, Pampa, the first Argentinean calf obtained by cloning of a fetal cell -skin fibroblast- was born. 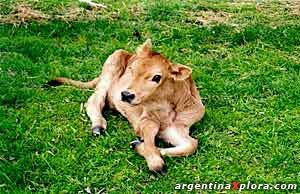 The female Jersey calf was born in a farm located in the Province of Buenos Aires through cesarean surgery. A specially trained veterinarian team was assigned by Bio Sidus to assist in the delivery. The calf weighed 37 kg and was 87 cm high. Objective: medicines for more people at lower cost. History preceding Pampa’s birth started over 6 years ago, when Bio Sidus decided to face a project to obtain medicines based on recombinant proteins secreted in cows’ milk to attain a significant reduction in production costs which would in turn result in an affordable product for more people. The project, based on the cloning of livestock technique, was focused in its first stage to obtain animals producing milk containing the human protein hGH or human growth hormone. hGH plays an important role in the treatment of hypophisiary dwarfism, among other disorders. In the future, Bio Sidus also plans to obtain human tissue plasminogen activator factor - potent fibrinolytic widely used to treat acute myocardial infarction- applying this technology. Now, some of these medicines are manufactured by mass cell cultures or bacterial fermentation which, though efficient, result in a costly product and consequently, in a restricted use. Six years of work and research. For many years, Bio Sidus assayed different strategies to obtain recombinant proteins. Early in 2001, the company started working on nuclear transfer technology, widely known as cloning, the most appropriate technique to attain this goal in our days. Bio Sidus developed this technology which allows to obtain in the lab, from any cell of an adult animal (though fetal cells may also be used) an embryo that will grow to become identical to the animal donor of the original cell. We thank Ms.Vanesa Barraco Head Institutional Relationships and Communications of Sidus Pharmaceutical Group of Enterprises for this information. Dolly was the first successful example of this technology. Today, the birth of Pampa ranks and gives prestige, through Bio Sidus, to science and technology applied in Argentina. In simple terms, the nucleus is removed from a bovine ovule and replaced by the nuclei of a cell obtained from the animal to “copy”. This new ovule is then induced to divide and fulfill an embryo’s functions. This embryo is implanted in the uterus of a nursing mother and let biological times to lead to the birth of the new individual. If during the laboratory process to obtain the embryo, an additional step is included inserting a human gene of interest (reprogrammed), the animal to be born will be capable of producing and secreting in its milk a human protein resulting from the expression of the inserted gene. Scientists at Bio Sidus set the goal to produce growth hormone. Only in Argentina, some 1000 kids sufering from hipophisiary dwarfism use this product, which is a costly drug that radically changes the course of this pathology. This molecule is currently obtained using recombinant DNA technologies by bacterial transformation, thus avoiding the need of cadaveric donors. Thus, it is possible to avail sufficient quantities of human growth hormone for therapeutical use, having the purity necessary to be administered as biopharmaceutical. Bio Sidus exports hGH to Latin American countries and some in Asia. • Master the cloning techniques for the selected animal species. • Insert the human gene of interest in a bovine embryo. • Implant the embryo in a cow made suitable receptor (it should be pointed out that receptor cow is the one that has been conditioned and stimulated to accept implantation and develop a proper pregnancy). • The offspring born should contain this gene “programmed” to operate in their mammal glands, synthesizing and secreting in its milk the human protein. • Develop purification systems to separate the desired protein from other milk components, thus obtaining a medicine for injection, safe and efficient to treat human beings. “The working time schedule was to train during the first semester of 2001 the necessary human resources and laboratory equipment necessary to obtain pregnancies of non-transgenic clones and once this goal had been achieved, start working on the production of transgenic animals.” says Marcelo Criscuolo, Executive Director of Bio Sidus. “In our original time-line we had planned to have the first births of clones by the end of 2002 and by mid-2003, birth of transgenic offsprings. Only when three years and a half will have elapsed, they will grow to produce the necessary milk to obtain the product. Later on, we need to develop purification steps of the human protein from milk and conduct the safety and efficiency tests that will finally lead to the success we are looking for: the application of the resulting product in patients treatment”, Dr. Marcelo Criscuolo added. To conduct this project, the company set up a specialized laboratory to work on animal cloning techniques and early in 2001, started with this new development stage. This was accompanied by the recruitment of a working team which included professionals in different areas of life sciences. 1. The starting point to obtain transgenic cattle is the development of cow cells having the genes that direct production of the protein of interest. In this first step of the process, recombinant DNA techniques are used to introduce human genes in the bovine cell genome. These are kept stable at the lab and the ones, which have effectively incorporated the human gene, are selected. 2. Then, the nucleus of non-fertilized cow ovules is removed and replaced by the nucleus of the genetically modified cell. Thus, transgenic embryos are generated for further implantation in the uterus of receptor females. When cows developed from these embryos reach adulthood, they will be able to produce in their milk the human protein directed by the inserted gene, i.e. human growth hormone in this case. The former cloning trials in Bio Sidus were made using skin cells of an Aberdeen angus bull. 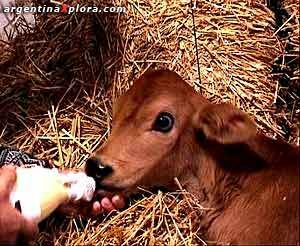 On January 28 2002, delivery of the first Latin American cloned calf obtained from cells of an adult animal occurred. Unfortunately, the animal died during delivery, an ordinary event in the scarce international experience in the field. It is estimated that the following animals to be born will include the human gene coding for human growth hormone. Therefore, they will be able to produce this protein in their milk for further use in therapy. a) It was necessary to count on a herd of at least 200 cows. Each week, almost 15 cows per week were treated to become receptive for a continuous availability of nursing mothers. b) Proper health conditions of animals and their overall care were first priority issues. c) Animals obtained by nuclear fusion use to have increased weight at birth, are prematurely born and may suffer from immaturity in some organs. This demanded the design of complex working protocols to comprehend these factors. d) Scarce experience in our country in this field pulled local scientists to learn, experience and generate original solutions to solve many of the technical steps required for the project development. e) Heavy investment fully supported by Bio Sidus. f) All the equipment and reagents used are imported. For that reason, the company had to replace the sluggishness in the reception of materials and their extremely high cost with innovative and imaginative solutions, by developing novel methods and reagents that can be prepared at our premises. g) The team of researchers had to operate perfectly both in the technical and human relationship aspects. This is a process that demands participation of many disciplines and each has to play its role accurately. 1. A genetic engineering team prepares the proper constructions to cause hGH to be produced in the mammal tissue of caws. This process requires several months of dedication and effort. 2. The construction above is then received by another team in charge of culturing cells to be cloned and of the human gene insertion process in them. 3. Other collaborators obtain bovine ovaries to extract oocytes which will be matured in vitro. Mature ovules and cells containing the human gene are transferred to a specialist in ovule enucleation and cell fusion who obtains the first cell of the future clone and activates it, generating a true bovine embryo. There follows a one-week program when the embryo is developed in special laboratory incubators till reaching the blastocistic stage. 4. A new team enters the scene carrying in special thermal bottles these embryos to the farm, where they will be implanted in the future nursing mothers which had been previously prepared by other team of professionals. There follows a 280-day period of relative ease when the farmers take close care of the pregnant animal and veterinarians monitor through ecographs and clinical controls the development of pregnancy. 5. Finally, birth occurs, by cesarean surgical procedure. This requires veterinarians specially trained in these procedures and other vets specialized in treatments and emergency surgery for newborns, and biochemists to conduct the necessary analysis and laboratory tests. Meanwhile, genetic tests are conducted on the animals, to assess that the offspring is a true clone and that it is transgenic, if applicable. Then, breeding of the calf begins, which also demands professional care of other collaborators. 6. Eventually, when the animal produces milk, it will be the time of protein experts to act. They will have to purify the human growth hormone, pharmacologists will formulate the protein, different multidisciplinary teams will conduct efficiency and safety tests. Only then the authorization for commercialization as pharmaceutical will be requested from health authorities. The team dedicated to this task is formed by more than 50 individuals, Only project leaders will be quoted.